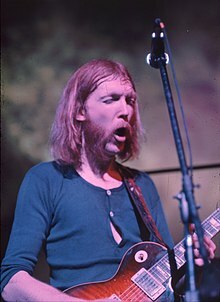 Howard Duane Allman (November 20, 1946 – October 29, 1971) was an American musician. He was the lead guitarist of the southern rock group, the Allman Brothers Band. He is often thought of as one of the greatest guitarists of all time, and is widely considered the greatest slide guitarist of all time. This page was last changed on 19 November 2018, at 20:41.